There are two chickweeds (Stellaria media and this chickweed, Cerastium fontanum) that are virtually indistinguishable unless closely examined. Both are mat-forming, in the Caryophyllaceae family, and occur in many countries. While the flowers are similar, mouse-ear chickweed is easily distinguished by its fuzzy leaves and stems, where common chickweed has hairless leaves and a single row of hairs along the stems. Chickweed is multi-functional because its presence decreases insect damage to other plants. It is a short-lived perennial plant that grows from taproots and often from sprawling, nodally-rooting branches. 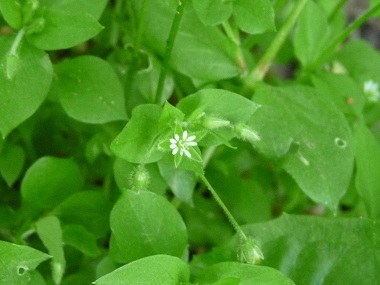 Distinguishing Features: Chickweed grows in a unique, intertwined manner, and it has small white flowers that have a slight split at the tip of each petal. It typically blooms in early to mid spring. 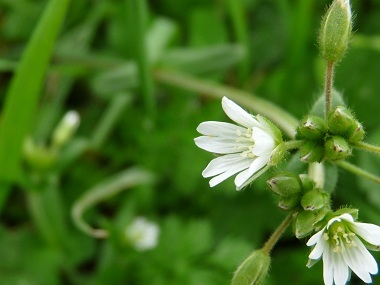 Flowers: Chickweed flowers are small, white, and are held tightly in the upper leaf axils. They open into loose branching clusters with age on ½ inch hairy stalks. Each flower is about 1 cm across with 5 deeply notched white petals, usually with ten stamens with light yellow to greenish or even reddish anthers and a round green ovary in the centre with 5 filament-like styles at the top. The five sepals are about as long as the petals, lance shaped with fine, spreading hairs on the outer surface. Flower stalks are also slightly hairy; at flowering time they are erect to ascending and longer than the sepals, spreading more when fruiting. Fields of Nutrition has medicinal benefits and vitamin/mineral content of Chickweed. Leaves: Chickweed leaves occur opposite, are toothless, stalkless, and somewhat variable in shape. Lower leaves are spatula to egg-shaped, .8 to 2.5 cm long and .6 to 1.2 cm wide, the upper leaves becoming more lance-elliptic to oblong. Height: Chickweed can grow from 5 to 50 cm tall. The stems may be erect but typically sprawl along the ground, rooting at the nodes, with short sterile branches crowded around the base, the longer flowering branches barely ascending towards the tip. Stems may be erect but typically sprawl along the ground, rooting at the nodes, with short sterile branches crowded around the base. Stems are covered with fine, spreading, non-glandular hairs. Habitat: Chickweed grows in many areas in a wide variety of habitats and soil textures. It is one of the most common weeds founds in lawns but it also grows well in cultivated fields, pastures, waste areas and in some deciduous forests. 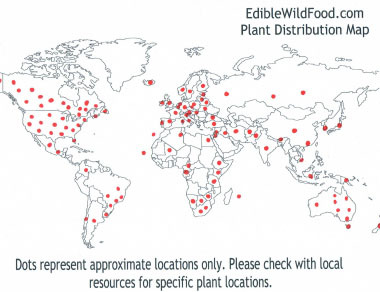 This plant occurs in many countries. 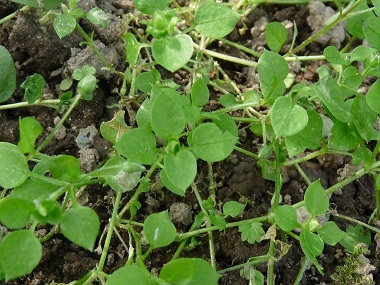 Edible parts: Chickweed leaves are used by adding them raw to salads and sandwiches. They can be tossed into soups and stews as well. When adding to a cooked dish, the stems and flowers can be used also. For more in-depth information (e.g. nutrition, medicinal values, recipes, historical information, harvesting tips, etc.) please check out our Chickweed PDF magazine.